அமிதாப், ஜெயா, அபிஷேக், ஐஸ்வர்யா, ஸ்வேதா மற்றும் ஆராத்யா, குடும்பத்தின் புதிய மகளை வரவேற்க கார்த்துக்கொண்டிருந்தனர். வார இறுதியில், பச்சன் குடும்பம் தங்கள் பாரம்பரிய ஆடையில் அலங்கரித்து ( அவர்களின் விருப்பமான அபு ஜானி மற்றும் சந்தீப் கோஸ்லா உடைகள் ) குடும்ப திருமணத்திற்கான சென்றுகொண்டிருந்தனர். 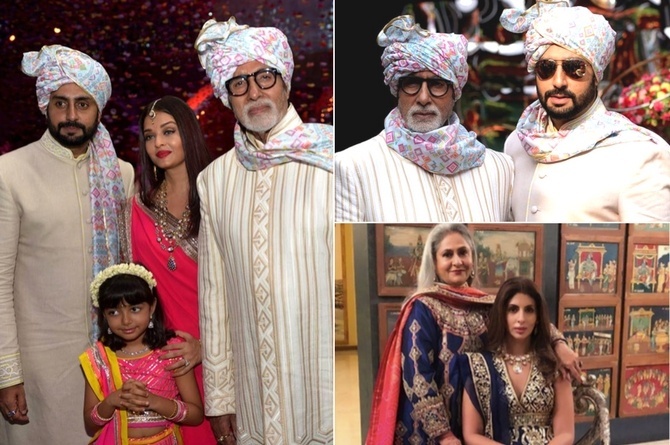 Amitabh, Jaya, Abhishek, Aishwarya, Swetha and Aradya were looking forward to welcome the family's new "daughter". For the first time, Bachchan's daughter-in-law, Aishwarya Rai appeared in the photo. All the celebrations were in the center. Here are some views of this wedding celebration in Mumbai. Amitabh has released some emotional photographs. On the social website revealed what happened behind closed doors. Click on the "Star Gallery" page to find the following wedding photos. 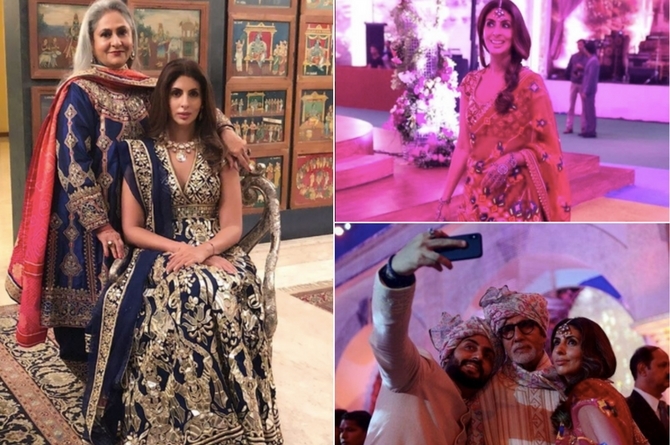 The wedding celebration which lasted for a few days was celebrated by the Bachchan family for the arrival of new daughter-in-law. Actually, within a few minutes, the wedding photos were widely spoken on the website.Abishak and Aishwarya's beautiful photographer was delighted to all of them. Amitabhin's Dumbler blog "The marriages of the marriages are a wonderful event in the family and can not tell the extraordinary joy of seeing the people who have not seen for many years, the old song, the kidding and the playfulness of the game .."
"The rituals start several days in advance ... Every moment is filled with joy and happiness .. Music and dance .. Conversation and fun., Wedding feast and traditional rituals .. How to perform each ritual house is the advice of the elders. Special clothes to be dressed in each ritual. All the things are gone The only remnants of the throat tiya unlimited joy! " Amitabh continued: "The father of the bride sends his daughter to Budhu's home .. The great blessing in the house for her arrival .. the happiness in giving .. the new arrival of the family .. will be welcomed with traditional music"
The happiness reflected on the face of the relatives .. Their efforts in the art work .. Fans surrounding the selphies .. the life is fast running and all the moments are documented. " Although Shweta Nanda's husband and children did not attend the show, she maintained herself a lot. Many times, Mother Jaya Bachchan was found nearby. This marriage was a good opportunity to get along. They were happy and happy with the new "daughter" in their family. ரஜினிகாந்தின் மகள் சௌந்தர்யா மற்றும் கணவர் அஸ்வின் விவாகரத்து பெற்றுள்ளனர்!